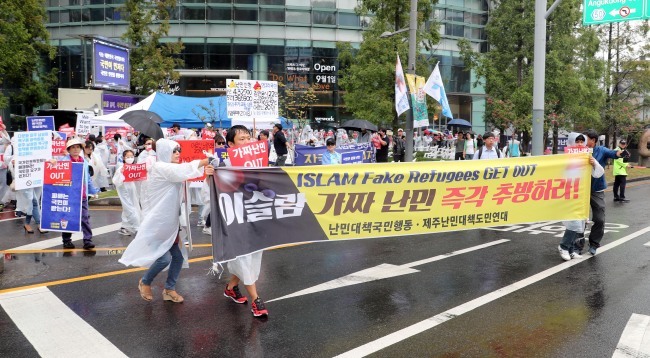 Two contrasting rallies, in support of and opposition to the Refugee Act, took place across from each other in Jongno in central Seoul on Sunday. The movements came two days after the Justice Ministry granted one-year humanitarian stay permits to 23 Yemeni asylum seekers. Under the rain, some 200 rallygoers demanded the government grant greater legal refugee status to more asylum seekers, and called for efforts to reduce discriminations against asylum seekers, in front of Bosingak. 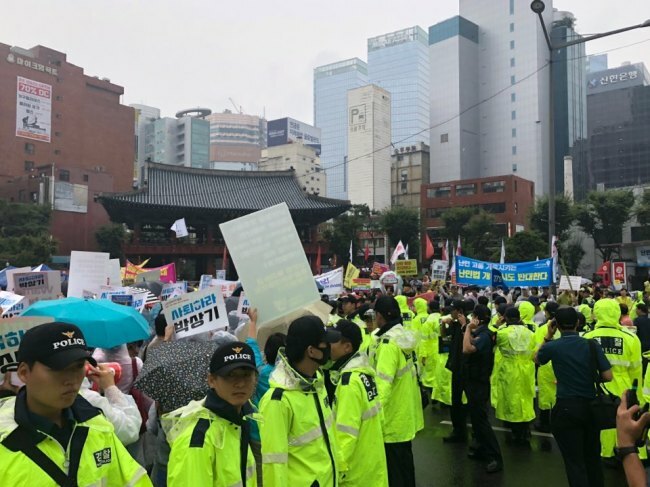 Just across the road, some 300 protesters gathered in front of Jongno Tower to chant for the abolishment of the Refugee Act, and chanted that the government should protect the interests of Koreans. Those in support of asylum seekers shouted for improvements to the refugee application process, citing the country’s low acceptance rate. “Pressure from the public should not become the reason to threaten the safety of asylum seekers. It is important (for the government) to accept these people who have nowhere to go, and think about ways to raise safety in the country,” said Kim Min-young from Amnesty International Korea. Holding handmade signs reading phrases such as “Stop the hatred against refugees” and “All are welcome, always,” the demonstrators chanted to demand governmental efforts to prevent the spread of Islamophobia and racial discrimination. They also criticized the “retrogressive attempts” of the government to limit the practice of refugee law. 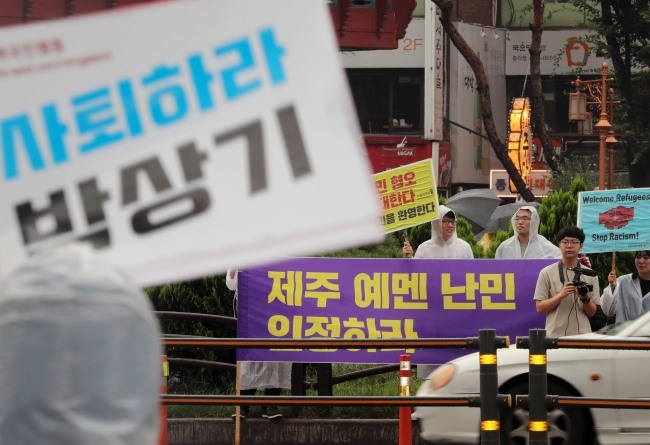 The rally, dubbed “Day of Action with Refugees” was organized by refugee and migrant rights groups including Amnesty International Korea, NANCEN Refugee Rights Center and several small political parties, including the Labor Party and Socialist Revolutionary Workers Party. Just across the road, opposing protesters denounced the liberal Moon Jae-in administration for accepting asylum seekers. Chanting, “Stop discrimination against (Korea’s) own people” and “Protect Korean nationals,” they demanded Justice Minister Park Sang-ki take action or step down from the post. Some of the protesters at the scene had come with their children. “The people are anxious and angry about the government’s decisions (to grant stay permits to asylum seekers,” the rally organizers of the People’s Solidarity Against Illegal Asylum Seekers said. She also said it is not normal for labor unions to participate and host rallies for asylum seekers, as they are the people who would take away the jobs of Korean nationals. The protesters from the two factions showed sharp divides in their opinions. “Wars are occurring around the world and I personally think no country is free from them. People often pity those in war when they are far away, but when these asylum seekers come to avoid the war, people turn their backs,” Kim Min-sun, 24, told The Korea Herald. A mother, who came with her young daughter, demanded for the abolishment of the Refugee Act. “How would we know if these asylum seekers have really fled from dangerous situations in their home countries? These people come to abuse the law to work here, taking our jobs,” the mother, who declined to give her name, told The Korea Herald. While no physical conflicts occurred at the scene, the tension heightened between the two groups when opposition protesters crossed the road toward Bosingak to march to the National Human Rights Commission, past the refugee supporters. “Stop racial discrimination!” shouted one side of the demonstrators, while the other side loudly retorted, “Go back to your country.” The two factions remained divided by the road and police were dispatched to form a human fence. The pro-refugee group also marched to Cheong Wa Dae after their rally. The Jeju Immigration Office on Friday had announced that it granted “humanitarian stay permits” to 23 Yemeni asylum seekers among the 484 Yemenis who had applied for legal refugee status after arriving on Jeju Island. Humanitarian stay permits are granted when an asylum seeker fails to meet the qualifications for refugee status here, but still needs a country to stay due to other circumstances, such as armed conflict at home or health reasons.